Some of you may have noticed that the esteemed Mr. Gaiman is my favorite living author. Even if he’s not everyone’s cup of tea, it’s hard not to notice him: books, graphic novels, award after award—the man is prolific and very good at what he does. 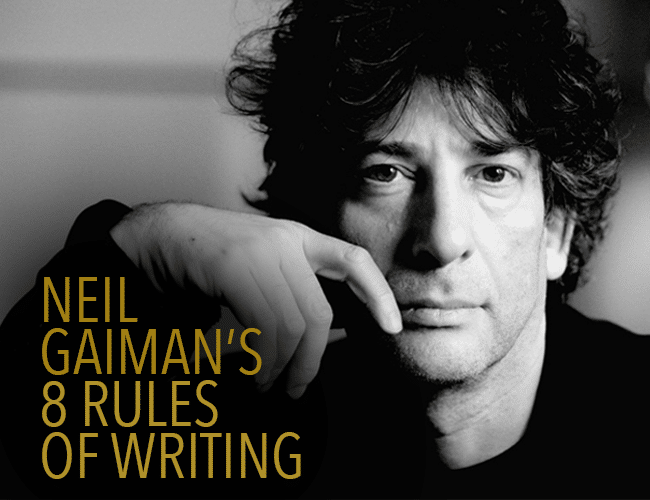 So when I realized he had eight rules of writing, you better believe I beelined to read them. And guess what? They’re fantastic … with a few explanations. Read on for more. Seems like a given, doesn’t it? Well, it isn’t; many of us want to write or think about writing or plan to write, but don’t actually write. Rule number one to be a writer is to write. Even if you feel you’re not ready. Especially if you feel you’re not. This can be challenging. Sometimes, you can’t find the right word until later. However, if we stop to try to find that right word, we often freeze. Okay, I freeze. I sit there looking through dictionaries and wikis and thesauruses, trying to find just the right word. And when I do that, I’m not writing. Stick with the first half of this rule. Put one word after another—and don’t stop. I KNOW how hard this is. When it just isn’t right yet, we can go a little crazy. Hear me out: it doesn’t matter what you have to do to reach that final page. It’s okay if you have to rip it out and fix it later. If there’s an ending, it can be fixed. This one’s actually a bunch of rules, but they’re important. 1. Put it aside. If you don’t put the thing down for at least two weeks, you won’t be able to read what’s actually there. Author-brain is an unfortunate malady that forces us to see what we wish was there, not what is there. 2. Read it pretending you’ve never read it before. Essential. Your readers won’t have read it before. If something isn’t clear to them, you need to fix it. This is a hard one to wrap your head around, but very often, it’s true. Your average reader can tell when something is off. They know they didn’t connect with that character, or didn’t understand that plot point, or had no idea where you were going with that tangent. Listen to that. If your reader’s lost, then something needs elucidation—but you’re the writer, and that means you know your piece better than they do. Trust your gut when it comes to fixing the problem; just pay attention when your reader says there’s a problem to begin with. This goes back to rule one: write. It also goes back to rule three: finish it. See the theme? You’ll never write a perfect story. That’s okay. No stories are perfect. They still have the power to speak to us. Ever heard, “No tears in the writer, no tears in the reader”? It also applies to laughter. If you don’t think what you’re writing is funny, why would anyone else? But it goes deeper than that: writing things that make you laugh isn’t just for your reader. It’s also for you. If you’re able to laugh at your own jokes, then you haven’t fallen out of love with your story. Stay in love. Laugh. It’s good for the soul (and whatever you’re writing). Sometimes you have to fake that confidence, and that’s okay, too. Don’t write letting your fears drive. 2. Write it honestly and tell it as best you can. That means the best you can at that moment in time. You owe no apologies for whatever you create. Sure, you’ll write better later; that doesn’t make what you did before embarrassing in any way. It was what you had to give at the time. Just as you (hopefully) wouldn’t shame a small child who’s still learning their ABCs, you shouldn’t shame yourself as you’re learning to write. Does your favorite author have “rules of writing?” Share in the comments. Pick one of these rules. Set a timer for fifteen minutes, and write, applying that rule with all your might. When you’re done, share your practice in the comments. Don’t forget to comment on three other writers’ practice, as well!